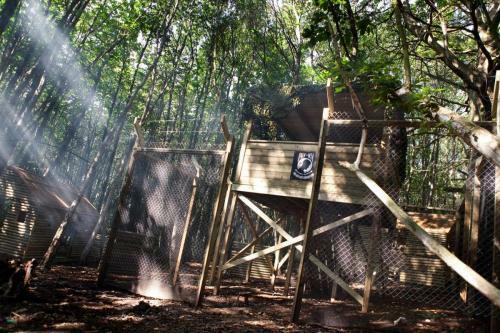 Delta Force paintball in Solihull, Birmingham has undergone a full refurbishment and is ready to host new adventures for paintball enthusiasts throughout the West Midlands. The most exciting addition to the centre is a brand new air system, with all guns now converted to run off air. We have also changed to Tippman semi-automatic markers. This is fantastic news for paintball players throughout the Coventry, Wolverhampton and Sutton Coldfield areas, as paintball markers powered by compressed air often results in better performance and reliability for players in the heat of the battle. The Delta Force construction team has battled through dropping temperatures over the past weeks to ensure the high standards at our paintball centres are maintained. The base camp has been upgraded to accommodate larger groups; changes include a larger shop and new flushing WCs. We’ve also introduced a dedicated de-kit area for players, meaning the end of day procedures run smoother than before. These upgrades reinforce our position as the ultimate paintball provider in the UK, as most other paintball centres offer only festival-style portaloos and shabby communal areas. Other exciting improvements to the centre include an enlarged car park and various game zone updates, including converting the Viet Cong Village scenario into the new POW Camp with two fortified guard towers. The ever-popular Castle Wallenberg game zone is also a brand new addition to the Solihull centre, as well as a haunted graveyard with life-sized tombstones. This means all players can truly experience a 5 star quality day of paintball with movie-set quality game zones. These changes are bound to get the adrenaline pumping – make sure you’re there to experience the thrill!